Harrison Craig cracked his first ton for Nassington against Histon. 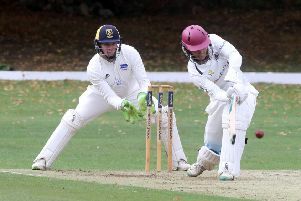 Teenager Harrison Craig cracked his first senior century as Nassington stormed to a 10-wicket Cambs Division One win at Histon yesterday (August 27). The 16 year-old was unbeaten on 117 when Nassington completed a convincing with with 25 overs to spare. Shakir Mahmood claimed six wickets for Ketton against Waresley. Craig struck 21 fours and one six in an innings that occupied just 85 balls. Captain Alex Laud was 79 not out from 71 balls at the close. The win, achieved on a day when most games were abandoned because of heavy rain, lifted Nassington into third place. Leaders Foxton were among those to finish and their win at Blunham means they need just two points from their final two fixtures to seal top spot. The battle between leading local sides Wisbech and Ramsey at Harecroft Road was abandoned with the home side on top. Sam Barlow bagged five wickets for Newborough at Weston Colville. Jamie Gollands (76) top scored in the Fenmen’s 197 and Ramsey were 71-5 when play was halted for the day. Rams’ skipper Michael Cafferkey claimed 5-37 as his side kept hold of second place. Shakir Mahmood (6-55) had bowled Ketton into a commanding position against Waresley (they were 99-9) when the rain arrived. March Town are just seven points away from an immediate retun to the top flight after easing to a two-wicket win at Granta Seconds. Skipper Tyler Phillips (3-21) bowled best as Granta were dismissed for 155 at Clare College and he also saw his side home with an unbeaten 26. Brandan Phillips had earlier made 54 as March recovered from 10-2. The title is also within March Town’s reach as leaders St Ives lost yesterday. There is an 11-point gap between the sides who meet next weekend (September 3). At the bottom the great escape remains on for Newborough after they claimed a second successive win. Vamshi Parvathaneni (4-27 & 41no) was the all-round star as the Bulls won by eight wickets at bottom club Weston Colville. Sam Barlow (5-21) did most of the damage as the home side were rushed out for just 137. Newborough are six points and two places from safety with two matches to go. Huntingdon pulled themselves clear of trouble with a 108-run win over Ufford Park. Newborough travel to Huntingdon next Saturday before hosting Ufford Park in their final fixture. Histon 210 (D. Poskitt 46, T. Norman 4-31, A. McDermott 2-31, H. Craig 2-37). Nassington 211-0 (H. Craig 117no, A. Laud 79no). Waresley 99-9 (S. Mahmood 6-55). Granta 155 (T. Phillips 3-21, S. Clarke 2-19, S. Freedman 2-27). March 156-8 (B. Phillips 54, T. Phillips 26, B. Pyle 20). Weston Colville 137 (S. Barlow 5-21, V. Parvathaneni 4-27). Newborough 139-2 (V. Parvatheneni 41no, D. Stratton 34, M. Cawley 29no).